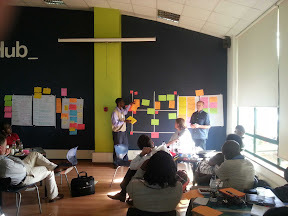 I’ve just got back from an energising week exploring open data and impact in Kenya, working with R4D and IDS at Nairobi’s iHub to run a three-day hackathon titled ‘Research to Impact’. You can read Pete Cranston’s blog posts on the event here (update: and iHub’s here). In this post, after a quick pre-amble, I reflect particularly on working with linked data as part of the event. The idea behind the event was fairly simple: lots of researchers are producing reports and publications related to international development, and these are logged in catalogues like R4D and ELDIS, but often it stops there, and research doesn’t make it into the hands of those who can use it to bring about economic and social change. By opening up the data held on these resources, and then working with subject experts and developers, we were interested to see whether new ideas would emerge for taking research to where it is needed. The Research to Impact hack focused in on ‘agriculture and nutrition’ research so that we could spend the first day working with a set of subject experts to identify the challenges research could help meet, and to map out the different actors who might be served by new digital tools. We were hosted for the whole event at the inspiring iHub and mLab venue by iHub Research. iHub provides a space for the growing Kenya tech community, acting as a meeting space, incubator and workspace for developers and designers. With over 10,000 members of it’s network, iHub also helped us to recruit around 20 developers who worked over the second two days of the hackathon to build prototype applications responding to the challenges identified on day one, and to the data available from R4D and IDS. A big focus of the hackathon development turned out to be on mobile applications: as in Kenya mobile phones are the primary digital tool for accessing information. On day four, our developers met again with the subject experts, and pitched their creations to a judging panel, who awarded first, second and third prizes. Many of the apps created had zeroed in on a number of key issues: working through intermediaries (in this case, the agricultural extension worker), rather than trying to use tech to entirely disinter-mediate information flows; embedding research information into useful tools, rather than providing it through standalone portals (for example, a number of teams build apps which allowed extension workers to keep track of the farmers they were interacting with, and that could then use this information to suggest relevant research); and, most challengingly, the need for research abstracts and descriptions to be translated into easy-to-understand language that can fit into SMS-size packages. Over the coming weeks IDS and R4D are going to be exploring ways to work with some of the hackathon teams to take their ideas further. The event also provided us with an opportunity to take forward explorations of how linked data might be a useful technology in supporting research knowledge sharing. I recently wrote a paper with Duncan Edwards of IDS exploring the potential of linked data for development communication, and I’ve been exploring linked data in development for a while. However, this time we were running a hackathon directly from a linked data source, which was a new experience. Ahead of the event I set up linked-development.org as a way to integrate R4D data (already available in RDF), and ELDIS data (which I wrote a quick scraper for), both modelled using the FAO’s AGRIS model. In order to avoid having to teach SPARQL for access to the data, I also (after quite a steep learning curve) put together a very basic Puelia Linked Data API implementation over the top of the data. To allow for a common set of subject terms between the R4D and ELDIS data, I made use of the Maui NLP indexer to tag ELDIS agriculture and nutrition documents against the FAO’s Agrovoc (R4D already had editor assigned terms against this vocabulary), giving us a means of accessing the documents from the two datasets alongside each other. The potential value of this approach become clear on the first day of the event, when one of the subject experts showed us their own repository of Kenyan-focussed agricultural research publications and resources, which was already modelled and theoretically accessible as RDF using the Agris model. Although our attempts to integrate this into our available dataset failed due to the Drupal site serving the data hitting memory limits (linked data still remains something that tends to need a lot of server power thrown at it, and that can have significant impacts where the relative cost of hosting and tech capacity is high), the potential to bring more local content into linked-development.org alongside data from R4D and ELDIS was noted by many of the developers taking part as something which would be likely to make their applications a lot more successful and useful: ensuring that the available information is built around users needs, not around organisational or project boundaries. At the start of the developer days, we offered a range of ways for developers to access the research meta-data on offer. We highlighted the linked data API, the ELDIS API (although it only provided access to one of the datasets, I found it would be possible for us to create an compatible API speaking to the linked data in future), and SPARQL as means to work with the data. Feedback forms from the event suggest that formats like JSON were new to many of our participants, and linked data was a new concept to all. However, in the end, most teams chose to use some of the prepared SPARQL queries to access the data, returning results as JSON into PHP or Python. In practice, over the two days this did not end up realising the full value of linked data, as teams generally appeared to use code samples to pull SPARQL ‘SELECT’ result sets into relational databases, and then to build their applications from there (a common issue I’ve noted at hack days, where the first step of developers is to take data into the platform they use most). 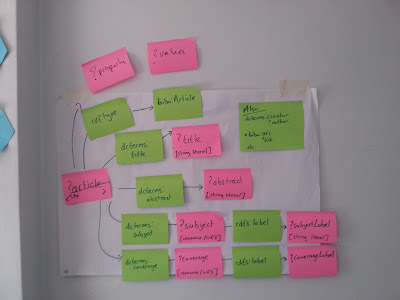 However, a number of teams were starting to think about both how they could use more advanced queries or direct access to the linked data through code libraries in future, and most strikingly, were talking about how they might be able to write data back to the linked-development.org data store. This struck me as particularly interesting. A lot of the problems teams faced in creating their application was that the research meta-data available was not customised to agricultural extension workers or farmers. Abstracts would need to be re-written and translated. Good quality information needed to be tagged. New classifications of the resources were needed, such as tagging research that is useful in the planting season. Social features on mobile apps could help discover who likes what and could be used to rate research. However, without a means to write back to the shared data store, all this added value will only ever exist in the local and fragmented ecosystems around particular applications. Getting feedback to researchers about whether their research was useful was also high on the priority list of our developers: yet without somewhere to put this feedback, and a commitment from upstream intermediaries like R4D and ELDIS to play a role feeding back to authors, this would be very difficult to do effectively. This links to one of the points that came out in our early IKM Emergent work on linked data, noting that the relatively high costs and complexity of the technology, and the way in which servers and services are constructed, may lead to an information environment dominated by those with the capacity to publish; but that it has the potential, with the right platforms, configurations and outreach, to bring about a more pluralistic space, where the annotations from local users of information can be linked with, and equally accessible as, the research meta-data coming from government funded projects. I wish we had thought about this more in advance of the hackathon, and provided each team with a way to write data back to the linked-development.org triple store (e.g. giving them named graphs to write to; and providing some simple code samples or APIs), as I suspect this would have opened up a whole new range of spaces for innovation. Overall though, the linked-development.org prototype appears to have done some useful work, not least providing a layer to connect two DFID funded projects working on mobilising research. I hope it is something we can build upon in future. This looks like an excellent effort and I’m really delighted to see that you are focusing on “intermediaries” (the extension workers in this case). The Community Informatics work that I’m currently doing with colleagues for a broad sub-Saharan implementation has equally come to the conclusion that intermediary organizations (we are including Co-op organizations, Farmer’s Unions, Women’s organizations and so on) are the most effective means of linking in to the grassroots at least for the moment. We should discuss the possibility of linking this work with ours as appropriate. Tim was very helpful during the hackathon. It was my first time to use SPARQL and was up and running in under 2 hours.